As the weather is getting chillier, all parents start to worry about their babies being warm enough. It’s important to find the right balance of warmth so that there isn’t a danger of overheating. The same as with car seats, snowsuits are a definite no go when it comes to babywearing, no matter how cold it is. When your baby is being carried in a sling, you’re both sharing each others body heat so already they are warmer than if they were in a pram. 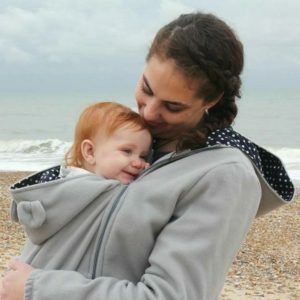 The other issue with snowsuits in slings is because they are quite bulky, it’s difficult to get ideal positioning and therefore harder to follow the TICKS rules for safe babywearing. Thin warm layers are the key to keeping warm, as well as potentially a coat that can go around both of you. A fleece jacket or all in one is a great option for keeping warm. These are quite thin but are great at keeping the heat in. If you’re worried about your baby’s legs and feet being colder than the rest of them as they are sticking out, you can get baby leg warmers and/or put thick socks or slippers on their feet. There are some great babywearing coats available for sale but they can be quite expensive. A good alternative is getting an extra big hoody that will zip around both of you or even get two hoodies and zip them together! A hat on baby’s head when outside is of course a good idea too. A good thing about a coat that goes around you both is if your baby falls asleep when out, you can simply take the coat and hat off when you go inside so they won’t get too hot! Nice article. 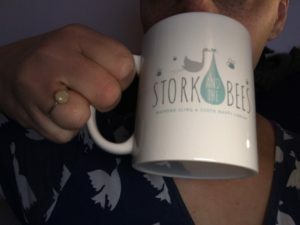 Great that you have shared the links for winter babywearing. Well done. Thank you.